When I was a teenager I thought I was a 'hippie"...untill I realized that hippys were into all sortsa peace and love crap...and all I wanted to do was ride my bicycle,watch horror movies,and get drunk. Yet I liked Led Zep,Alice Cooper,and Kiss. I guess I lumped everybody with long hair as a 'Hippy'. I wasn't a hippy. I was a geeky little weirdo! You certainly weren't a hippy; more like a Metalhead. In honor of our friends, the hippies, I offer this one. It should be easy. I definitely know that one! But I'll give someone else a chance! Lady, you are my kind of weird. Not "Johnny Firecloud". I would love to see that one. I'v hear some lovingly awful things about it. These are some not very nice hippies in this movie. If I answer this one then its cheating? If you know the answer, sing it out. Or I'm showing a picture of the rat-kabobs next. One of my favorites...I DRINK YOUR BLOOD! RC, I think we would have been great drinking buddies. You seem to have similar taste in weirdness. I'll buy the first round! 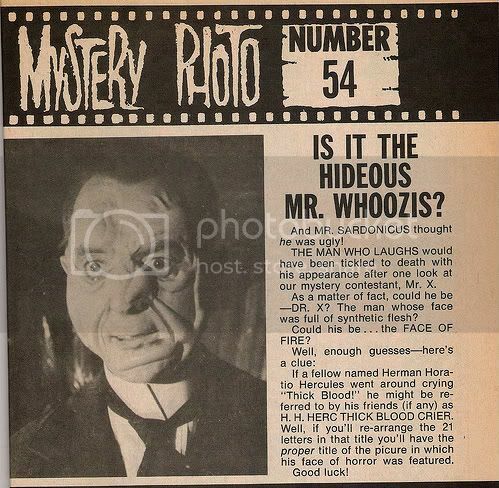 I got his pic from an old Famous Monsters Mystery Photo! I'll post the FM clue of the scrambled title if it's a little too tuff! 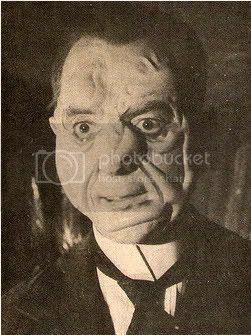 The incredible melting Lon Chaney? H H HERC THICK BLOOD CRIER! Good luck!